Inbuild Protection Circuit to prevent the harm of reverse voltages. LCD Back Light Function with Indicator Switch. 3 Ranges of Insulation Measurement. 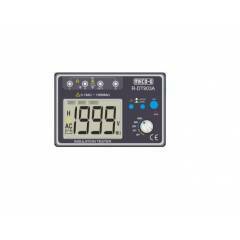 MECO-G Digital Insulation Resistance Tester, R-DT903A is a premium quality Insulation Testers from MECO-G. Moglix is a well-known ecommerce platform for qualitative range of Insulation Testers. All MECO-G Digital Insulation Resistance Tester, R-DT903A are manufactured by using quality assured material and advanced techniques, which make them up to the standard in this highly challenging field. The materials utilized to manufacture MECO-G Digital Insulation Resistance Tester, R-DT903A, are sourced from the most reliable and official Insulation Testers vendors, chosen after performing detailed market surveys. Thus, MECO-G products are widely acknowledged in the market for their high quality. We are dedicatedly involved in providing an excellent quality array of MECO-G Insulation Testers.